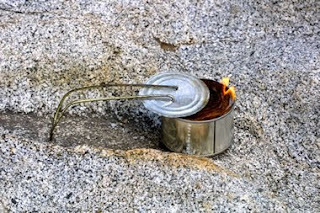 One of the most innovative outdoor cooking methods, and excellent to have for power-related emergencies at home, is the simple homemade tin can stove which can be used for frying, boiling and toasting. It is best used for one or two people because of its small size. It is also disposable; just recycle after use. 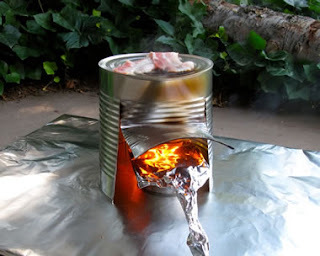 A buddy burner (a tuna can—or a can similar in shape—filled with rolled corrugated cardboard and melted paraffin) is the main source of heat for a tin can stove. First, cut out one end of the #10-size can (102-ounce or 6-pound 6-ounce) available from restaurants. With tin snips cut two slits 3 inches high and 31⁄2 inches apart on one side of the can at the open end, leaving the top attached. Pull the door open. With a punch-type can opener, punch two or three holes on the backside of the can near the top. These act as a chimney, allowing the smoke to escape during cooking. 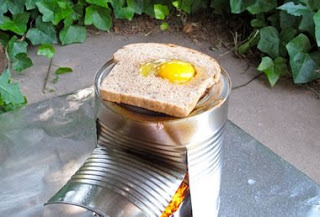 A skillet may be used on top of the tin can by removing the top so it is open. When using pans, be sure to rub liquid soap on the bottom of the pan so they will clean easily. Cut corrugated cardboard (across the corrugation so holes show) into strips the same width as the height of the tuna can. 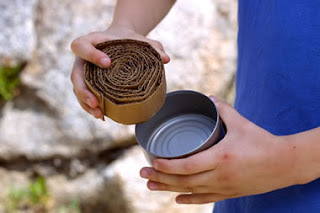 Roll strips tightly to fit inside the can. Heat the wax in a double boiler and pour melted wax into the cardboard. Or set a piece of wax on the cardboard and light a match next to the wax (see picture). Continue adding wax near the flame until the buddy burner is filled. 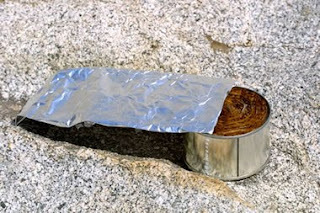 The cardboard serves as a wick, and the wax serves as the fuel, providing the heat for the stove. 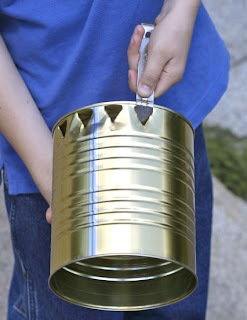 When lighting, it may help to lay the can on its side so that the flame spreads across the cardboard. It will burn 1 ½ to 2 hours. 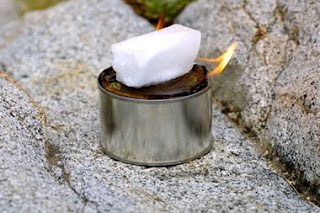 To refuel, add a new small piece of wax when it is burning and let it melt into the burner. When finished, let the wax harden before storing. 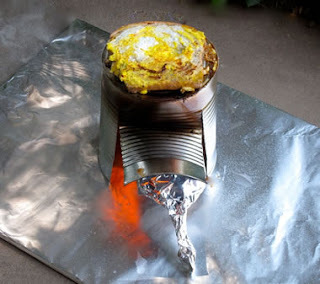 A damper covers the buddy burner to control the amount of heat. 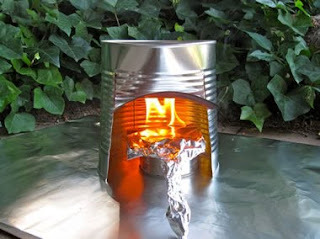 It is easy to make out of foil or from the lid of a tuna can. To make: fold an 18-inch by 15-inch piece of heavy-duty foil into 3-inch sections again and again until all the foil is used. Bend the foil down as a handle to set over the tuna can. To make a handle with a cardboard pant hanger (minus the cardboard), bend ends together. Punch holes in the top of the tuna can lid on each side. Wire the lid to the ends of the hanger. In a large frying pan, fold bacon strips into “V’s.” Cook on one side and turn over. Tear a hole in the center of the bread slice large enough to hold an egg. Place the bread slice onto the bacon, and break an egg in the center of the bread hole. Season with salt and pepper. When the egg is done on one side, turn over and cook to desired doneness. Serves 4. •For eggs and bacon on one side and French toast on the other, with a fork scramble the egg and draw from the center over the bread. Turn over to cook the French toast. You now have eggs and bacon on one side and French toast on the other. I must admit this is one of my favorite outdoor meals. Dian on one of her up coming adventures. Just email Dian at contact@dianthomas.com. As the fall nears and the fruits and vegetables in the garden or farmers market get plentiful, I begin thinking of all the ways that I can preserve them for use throughout the year. Drying you own fruits and vegetables is a key to keeping some of them for use later on in the year. I love fruits that are dried all the way from apples to peaches. It's easy and fun to dry your own foods with a home food dehydrator. Drying foods at home is becoming more and more popular as a means of preservation for general home use as well as for lightweight camping. There are many advantages to drying your own foods. Dried foods occupy from one-fifth to one-twentieth of the storage space and weight of canned or frozen foods. When properly stored, most dried foods keep for at least a year, retaining top quality and nutritional value. There is no danger of botulism with dehydrated foods. As with other methods of preservation, drying in season is a tremendous money-saver, adding interesting variety to home food stores and snacks. The drying process is quite simple. Sliced or cut foods are placed on racks, which allow air to circulate around the food. The moisture slowly evaporates because of an elevated temperature, and the circulating air removes the moisture. If you live in the Southwest or a warm climate where you can count on five or more days of continuous sunshine, low humidity and temperatures about 90° F daily, you might want to try nature's way of preserving foods. Sun-drying is the most time-consuming and least expensive method of food preservation. Place foods to be dried on screens (polypropylene or nylon coated fiber glass) and find the warmest, sunniest and safest spot in your yard. By safest, I mean a place where the neighborhood dogs, cats or children won't nibble up your goodies before they dry. Place the food as far away from dust, roads and exhaust as possible. To protect it from birds and insects, cover it with cheesecloth or nylon netting—propped up so it doesn't touch the food. Be sure that the location has good air circulation, and if you choose to stack the screens after the food has partially dried, rotate them from top to bottom two or three times each day. Occasionally turning the fruit facilitates even drying. Stacking the screens during the last half of the drying process produces a nicer flavor and color because the food is less exposed to direct sunlight. The food should be brought in at night or at the first sign of rain, because moisture on partially dried food will cause it to mildew and spoil. Oven drying tends to produce lower-quality dried foods because it is difficult to maintain a temperature below 140° F unless your oven is specifically designed to do so. Most convection ovens work quite well for drying because they have a fan that circulates the air and removes moisture. Since ovens vary in their range of temperature, size and efficiency, experiment with yours to see what produces the best results. Make sure that your oven will maintain a temperature of 140° F or below before attempting to dry in it. Make a pillowcase-type covering out of nylon net to fit snugly over each oven rack so food can be dried on the net without falling through. If you want to dry larger quantities, try obtaining a couple of extra oven racks (frequently available from used appliance dealers) to make the most of your energy and the oven's. An average oven rack has about 21⁄2 square feet, so with four racks, the total drying area would be about 10 square feet. Load the racks with the food to be dried, leaving space between the foods for adequate air circulation. Don't overlap food on the trays. This results in unevenly dried food and longer drying times. If your oven does not have a convection feature, set it to the lowest setting (ideally between 125° and 140° F) and crack the door about 1⁄2 to 1 inch in an electric oven or 8 inches in a gas oven by inserting a lid near the door hinge. Check the oven temperature on each rack with an oven thermometer and adjust accordingly. In some gas ovens, the pilot light keeps the oven warm enough. If your gas oven does not have an automatic shut-off valve, check it occasionally to make sure the flame is still on. Rotate racks every 2 to 3 hours for the most even drying. Cool the foods before you check them for dryness. A wide variety of consumer dehydrators are available in stores or through catalogs or TV ads. Take the time to compare different dehydrators to make sure you buy the most efficient one, and one that will best suit your needs. Box dryers also work very well. The only limitations are the lack of expandability and the need to occasionally rotate the trays. Making your own dehydrator is impractical due to the availability and reasonable prices of consumer dehydrators on the market. Dryers made from wood are unsafe due to their flammability. They are also difficult to clean and use far more electricity than metal and plastic manufactured ones. Safety features should include U.L. approval, nonflammable construction, enclosed electrical components and a safety switch in case of thermostat failure. The cost of operation depends on the wattage of the heating element. If a portion of the air recirculates within the dryer and the heating element is thermostatically controlled, the cost of operation will be lower. Check for the location of the closest dealer and service. Also check for length of warranty and what it covers, shipping costs if the dryer needs to be returned to the manufacturer for repairs, and how easily parts can be replaced after the warranty has expired. Dian Thomas is and outdoor specialist authoring several best selling book on outdoor camping and cooking. Roughing it Easy sold over a million copies all over the world. The check out Dian innovative, creative and fun ideas go to www.DianThomas.com. She also take people to China. For more information write to her at contact@dianthomas.com. By Carolyn Nicolaysen - Original article found here. Along with traditional Back-to-School supplies like clothes, books, bed linens, computers, pencils, and paper, there is another list your college student should remember this year: Because of the H1N1 flu pandemic, the list should include canned foods, hand sanitizer, medications and a good dose of knowledge about caring for roommates with the flu. As preparation for this subject, I contacted BYU Hawaii, BYU Idaho, and made calls to BYU Provo to ask their advice and to ascertain the preparations they have made. What I discovered is that this is a huge job for a safety committee. There really is no way to completely prepare to care for potentially thousands of students who could become ill or quarantined during a flu pandemic. Parents and students have been asked for years to bring a 72-96 hour emergency kit to school which can be used in case of a natural disaster or other emergency, for short term survival. That advice continues. For those traveling to school by car, be sure this kit also includes items that will keep your student safe on the road should they have car problems or experience delays because of weather while traveling. Students are asked to remain in their dorm or apartment unless they become ill.
All social gatherings, devotionals, and church services are canceled. Students are able to communicate using the telephone or the computer, but interaction with others is severely restricted. Laundry facilities outside of a student's quarantine area are off limits. Students are not able to shop for food or medications because of quarantine restrictions. Do universities really envision how they would implement these limitations in a pandemic? Yes, they do. Should a pandemic become severe there may not be regular delivery of food and other supplies to local stores. This would be a great concern anywhere, but might be of even greater concern if your student attends BYU Hawaii, a great school in a great state that happens to be in the middle of the Pacific Ocean. Any interruption of the supply chain in Hawaii by storms or pandemic is a serious matter. In addition to a great kit for short term survival at home or on the road, students should be prepared with a supply of food. BYU Hawaii has a food supply sufficient to feed students for a short period of time but not for a sustained quarantine. Students on all campuses will be on their own as far as food and water are concerned should a serious pandemic arrive. A student's food cache should include items that can be stored in a small space that are easy to prepare. Foods should be from all the major food groups. They should also include foods which are good to eat when recovering from the flu, and drinks which can be converted to hydration formulas for anyone who has become dehydrated. Students without cooking facilities and/or without refrigeration should be storing canned and ready to eat foods. Do not forget a manual can opener. Space is limited in a dorm room or apartment, but since none of the schools I spoke with has the ability to supply or deliver food should quarantine be made mandatory, this is an issue that has to be considered. While I was writing my book Mother Hubbard: What She's Doing Now I was asked by a friend about purchasing a two- week supply of food for his kids at college. At that time I used the spreadsheet calculator I had just finished to establish the amount of food needed and proceeded to calculate the cost of a two-week supply. It was $115.00. That is a small amount to ensure your child will have food to eat should the need arise. Medications are also important to store before quarantine becomes necessary. BYU Hawaii recommends students have a three-month supply of the prescription drugs they are currently taking. All students should plan to have a precautionary supply of prescriptions on hand. They should also have on hand a supply of medications to treat flu symptoms. While you are in the pharmacy stocking up, add N95 masks, disposable medical gloves, (food service gloves are too thin), hand sanitizer and lotion for the dry hands caused by sanitizers. You will also want to add hygiene supplies such as TP, toothpaste, shampoo and tissues. And remember, when you store prescription drugs, keep them secured where others will not have access to them. Students will want to keep their surroundings as free from germs as possible. They should have disinfectant wipes and other cleaners to disinfect hard surfaces. The BYU campuses have communication systems set up to keep students and parents informed should quarantine become necessary. They are prepared to use email, the phone system, text messaging and their web sites as conditions require. Both BYUI and BYU Hawaii have been conducting a campus wide campaign to help students understand the importance of hand washing and other preventative measures. There is always more that parents can do to educate and prepare their families. Plan now to send your students back to school with the information they need in an easy to understand form. If a self quarantine should occur, students will need information in chart form or something very simple to understand and follow. Cover your mouth and nose with a tissue when you cough or sneeze. If you don’t have a tissue, cough or sneeze into the elbow of your sleeve. Wash your hands with running water and soap or alcohol-based hand sanitizer after coughing or sneezing. Wash hands as often as necessary including after touching public surfaces such as door knobs and grocery carts, and after shaking hands. If you become ill or someone in your apartment is ill, stay home until at least 24 hours after all symptoms have passed or for seven days, whichever is longer. Clean hard surfaces and items that have frequent hand contact with such as desks, door knobs, keyboards, or pens, with disinfectants. If you have been around someone who is ill, change clothes and wash exposed clothing immediately. If a roommate becomes sick, isolate them in a separate room. Limit the number of people who take care of the sick person and provide a surgical mask for the sick person to wear whenever anyone else is in the room. Use disposable gloves whenever you enter the room of someone who is ill and dispose of them immediately after leaving their room. Get a medical evaluation for sick students as soon as symptoms occur. If a member of your household has any preexisting medical conditions, have them evaluated immediately. Know the symptoms for which you should take a patient to the hospital. Stay in regular communication with school health officials and your parents to report any changes in patient conditions. Information for all of these topics can be found in previous Meridian articles. See our Emergency Preparedness Archive. One concern school officials have is that students will overwhelm the hospital and make it difficult for medical personnel to treat those who truly need the care. Students should report to the health clinic first when they suspect they have the H1N1 flu. A big concern is that students understand the symptoms of both the seasonal flu and the H1N1 flu, and that they understand the importance of being diligent advocates for their own care. Many doctors are no longer testing for the swine flu and even more are simply prescribing anti-viral drugs to anyone who has symptoms. This is extremely dangerous as a patient could have another illness which may go untreated unless they understand the importance of monitoring their own symptoms. A doctor should always do an exam before prescribing a course of medication. Summer camps throughout the country, including Especially For Youth in Provo have had serious outbreaks of the H1N1 virus. We should expect more outbreaks when Fall semesters and the flu season begin in September. The H1N1 flu has been mild during the first phase. Even in its mild form people are dying everyday from this flu. There are no guarantees it will remain mild when it returns, but these simple precautions will provide peace of mind for parents, and enable students to return to their studies better prepared with the knowledge they need to stay healthy, and the supplies they will need to care for themselves – just in case. For more information about pandemic preparations, see Carolyn Nicolaysen’s book Prep Not Panic: Keys to Surviving the Next Pandemic. For information about a two week food supply see Carolyn's book Mother Hubbard, What She's Doing Now or visit her blog. A Garden for the Blind! Read Mel Bartholomew's response here. Avoid debt. Learn self-restraint by spending less money than you make and saving money to purchase what you need. Avoid debt except for vital needs, education and the purchase of a modest home. If in debt, try to pay it off quickly. Use a budget. Keep a record of your monthly income and expenses. With this information, set up a family budget. Establish how much you will save, how much you will spend for food, housing, insurance, utilities, etc. Reduce what you spend on things that are not necessary. Teach family members early the importance of working and earning. Children should be responsible for the decisions that affect their own money and face the consequences of their bad spending. As your children mature, help them understand the family financial situation, budget goals and their individual responsibility within their families. Work toward home ownership. Improve the home you acquire so you can use the accumulated equity for a better home if you decide to sell it. Appropriately involve yourself in an insurance program to avoid the significant debts place upon families when they are uninsured. Involve yourself in a food storage and emergency preparedness program. Planting and harvesting a garden annually can help the family budget and encourage food storage. Build a reserve. Accumulate savings little by little and use it for emergencies only. This is another good reason to have 72-hour packets. Something to grab and go - taking with you important information that you wouldn't want to loose, food, clothing, sanitary needs, medical needs, and sleeping arrangments - on a moments notice. BEIJING – A typhoon pummeled China's eastern coast Sunday, toppling houses, flooding villages and forcing nearly a million people to flee to safety. Officials rode bicycles to distribute food to residents trapped by rising waters. Morakot, which means "emerald" in Thai, made landfall in China's eastern Fujian province, carrying heavy rain and winds of 74 miles (119 kilometers) per hour, according the China Meteorological Administration. At least one child died after a house collapsed on him in Zhejiang province. People stumbled with flashlights as the storm enveloped the town of Beibi in Fujian in darkness, the official Xinhua News Agency said. Strong winds uprooted trees or snapped them apart, while farmers tried to catch fish swept out of fish farms by high waves. Village officials in Zhejiang rode bicycles to hand out drinking water and instant noodles to residents stranded by deep floods, while rescuers tried to reach eight sailors on a cargo ship blown onto a reef off Fujian, Xinhua reported. Morakot was expected to weaken as it traveled north at about six miles (10 kilometers) per hour, but still bring strong winds and heavy rains to Shanghai, the meteorological administration said. About 1 million people were evacuated from China's eastern coastal provinces — more than 490,000 in Zhejiang and 505,000 in neighboring Fujian. Authorities in Fujian called 48,000 boats back to harbor. Five houses were destroyed by heavy rain ahead of the typhoon's landfall, burying four adults and a 4-year-old boy in debris, Xinhua said. The child died after emergency treatment failed, it said. Another 300 houses collapsed and thousands of acres (hectares) of farmland were inundated, Xinhua said. Dozens of domestic flights were canceled and delayed in Fujian and Zhejiang, and bus service in Fujian's capital, Fuzhou, was suspended, it said. Taiwan, meanwhile, was recovering after the storm dumped more than 80 inches (200 centimeters) of rain on some southern counties Friday and Saturday, the worst flooding to hit the area in half a century, the Central Weather Bureau reported. Taiwan's Disaster Relief Center said a woman was killed when her vehicle plunged into a ditch in Kaohsiung county in heavy rain Friday, and two men drowned in Pingtung and Tainan. It said 31 were missing and feared dead. Morakot hit Taiwan late Friday and crossed the island Saturday. The Disaster Relief Center reported Sunday that flash floods washed away a home in southern Kaohsiung, leaving 16 people missing. Three were swept away in southeastern Taitung county, including two policemen helping to evacuate villagers. Twelve others were missing, including three fishermen from a capsized boat and three others whose cars fell into a rain-swollen river, it said. In southern Pingtung county, 4,000 people were stranded in inundated villages waiting for police boats to rescue them, news media reported. In Taitung county, a six-story hotel collapsed and plunged into a river after floodwaters eroded its base, but all 300 people inside were evacuated and uninjured, officials said. In the northern Philippines, the typhoon and lingering monsoon rains left 21 people dead and seven others missing in landslides and floodwaters, including three European tourists who were swept away Thursday, the National Disaster Coordinating Council said Sunday. The bodies of the Belgian and two French citizens were found Friday, the council said. Meanwhile, Xinhua said three fishermen died and 26 others were missing from Tropical Storm Goni, which hit Guangdong on Wednesday but weakened into a tropical depression by Sunday. Helicopters and ships were searching for the missing crew. Associated Press writers Annie Huang in Taipei and Jim Gomez in Manila contributed to this report. Welcome to my blog, Filling Your Ark. I hope you will find some helpful information that will both educate you in the purpose of emergency preparedness and bring success in your food storage endeavers. Below you will find gardening Filling Your Ark Newsletters that I put together in 2008. Someday I will finish November and December :)! There are also helpful PDF documents, websites, and YouTube videos on building and using your food. Enjoy and learn. FS on $5 per week! Store it! Don't Ignore it!